If you like kids, this British Pathe video is special and shows a young girl taking a miniature automobile out for a ride. We do not know anything about the car other than the film identifies it as being one-h.p. It is dated 1931, but we would be surprised if that were the case as the cars on the streets look earlier. It appears to have possibly been filmed in a French city. Please tells if you know anything about it. 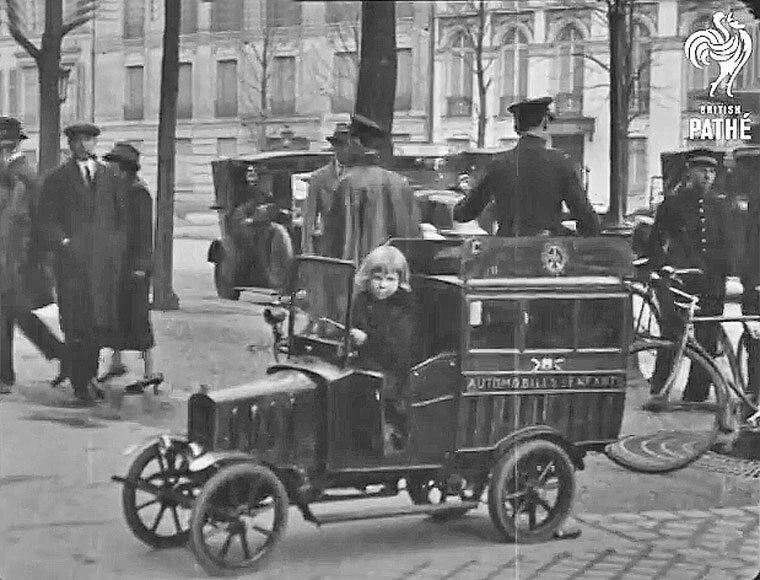 This entry was posted in Auto photos 1885 - 1920, Auto photos 1921 - 1942, video, Women and Vehicles and tagged The Auto-Baby Film, Young girl takes a car for a ride though a French city. Very nice movie! I would indeed say mid-twenties, the city of course Paris. You can see a Parisian De Dion-Bouton bus with its characteristic front and scuttle. Also nice the early ’20s Bellanger (with very round radiator) parked along the side, and further mid-twenties Renault, Citroën etc. The little van I never saw before, so no info about that one. Ariejan, Thanks for the details. What was she doing when she raised the hood, at the beginning? At first I thought she was cranking it, but it looked like she was using some pliers or a wrench. Simulating a “repair?” Turning on the fuel? Shawn, I have watched it a number of times and yes she appears to be turning something on with a wrench. The video really is not clear enough to positively id anything under the hood, but it may have been a small one cylinder engine? If not, our second guess would be that it could be an electric. I’m thinking it’s a staged shot for the film. Like “look at the little girl raising the hood, and wrenching on her car.” Guess we’ll never know! The city is definetely Paris in de early twenties. The bus is a Schneider type “H ” used in Paris from 1916 ´till 1938. At that time, almost all de Parisian buses (Brillié-Schneider, Schneider and some De Dion-Bouton) had a centrifugal front cooler in 3 sections of Goudard & Menesson Type. From 1926, the Schneider buses were equiped with tubular pneumatics. They had a 4 cylinders engine (34hp), could transport 38 people, 16 in first (leather seats), 12 in second (wooden seats) and 10 on the outside platform.